Welcome to a New Year and a whole host of recipes and product reviews to come here on Feasting is Fun. 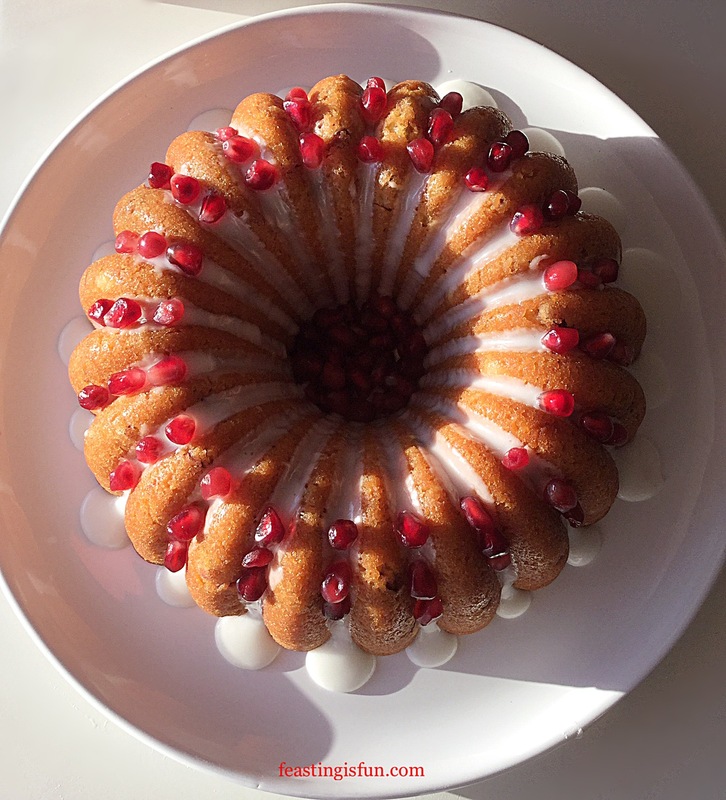 Easing into 2018 with a simple, yet stunning and delicious bake, is this Pomegranate Lemon Drizzle Bundt Cake. While making the most of seasonal pomegranates which are readily available in most larger shops at this time of year. Also added is a healthy dose of lemon, helping our bodies fight off any nasty bugs. We are almost making a health food here! 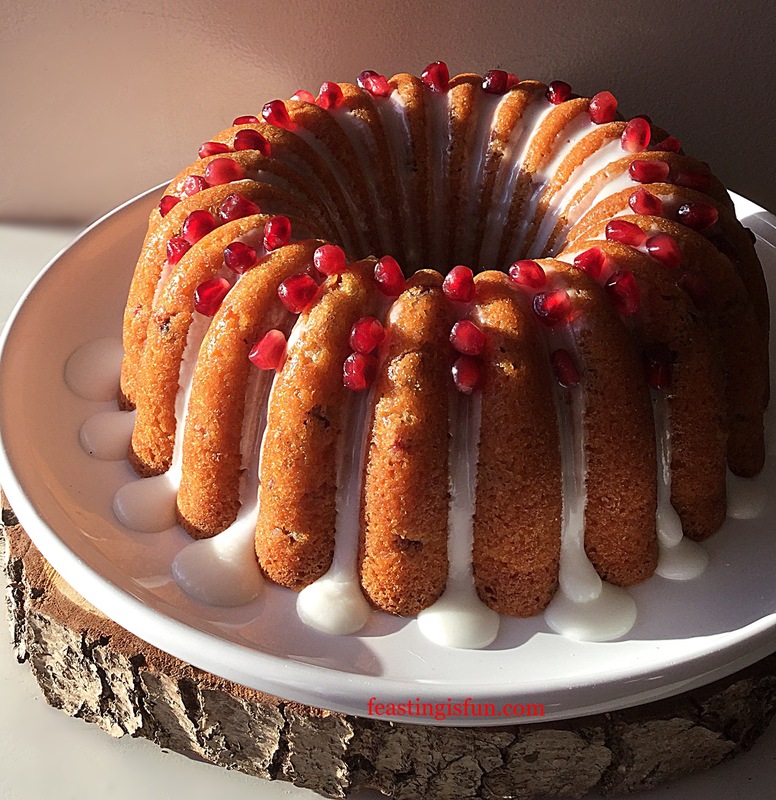 Since this cake has such a light texture the additional crunch from the pomegranate seeds provides added texture and flavour. Inside the cake their juices release, complimenting the lemon zest. While the garnet nuggets used for decoration provide an unexpected fresh burst of juice. Meanwhile the lemon drizzle lends an intense, lemon tang on the tongue. 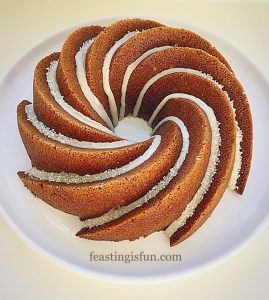 Each bundt pan is different. Yet some share similar moulding, creating a range of pans. 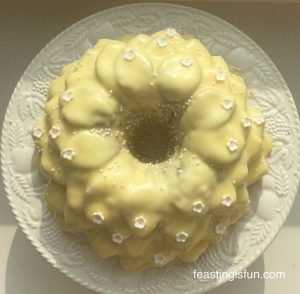 Lemon Lime Gin Heart Bundt Cake uses the elegant heart pan which has the same deep grooves as the elegant party Bundt used here. Deep, regular grooves define the entire shape of the baked cake. Indeed a light dusting of icing sugar would enhance, in a much simpler way, the outline of this bundt cake. A useful tip should the drizzle icing be a step too far! 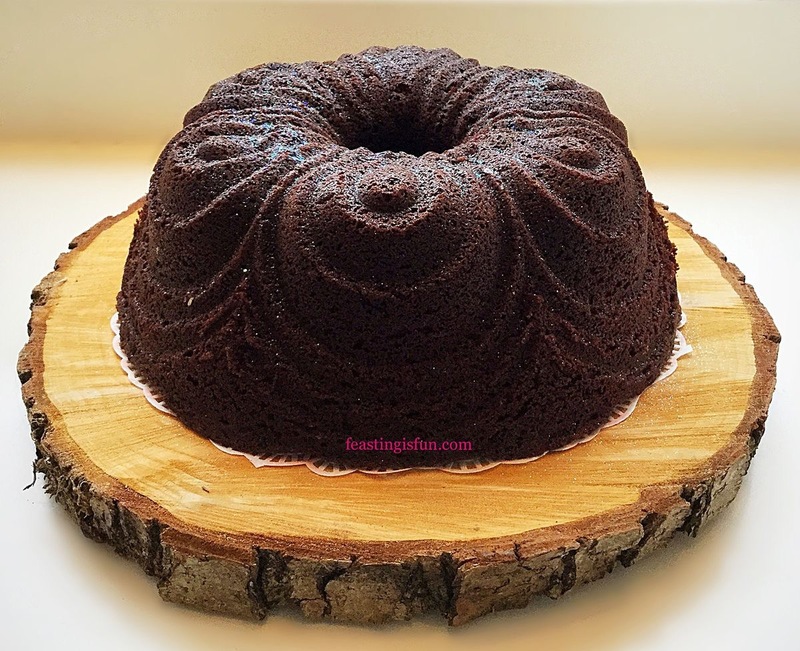 Note: you will need a 10 cup Bundt Pan (tin) for this recipe. If using a smaller tin ensure that it is not filled more than 2/3 full. Also for guaranteed release of the cake once baked I highly recommend using Wilton cake release. Spray or brush on to the inside of the bundt pan, taking care to cover every part. First of all prepare the Bundt pan as detailed above. Place the butter, sugar and salt into a large bowl. Whisk together until pale and creamy. Next add all 4 eggs, sour cream and vanilla extract. Sift the flour and baking powder on top of the wet ingredients. Finally add the finely grated zest of two lemons and 125g of pomegranate seeds. Carefully fold the ingredients together until fully combined. 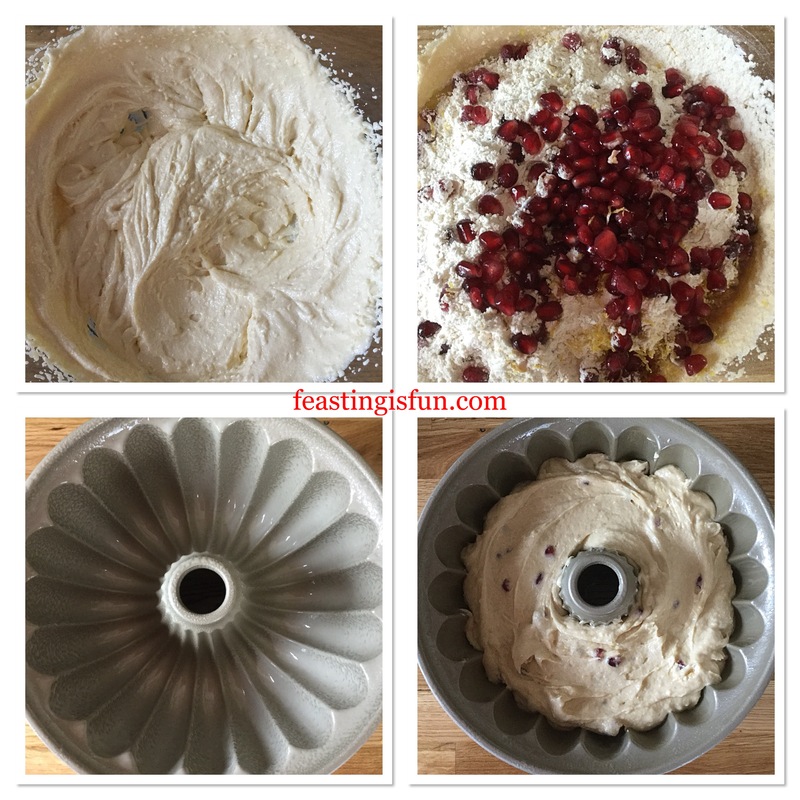 Spoon the cake batter into the prepared Bundt pan. Smooth the top for an even finish. Place the cake into the centre of a preheated oven and bake for 1 hour 15 minutes – 1 hour 30 minutes. The cake is baked when it is golden in colour, shrinking away from the sides of the tin and an inserted skewer comes out clean. 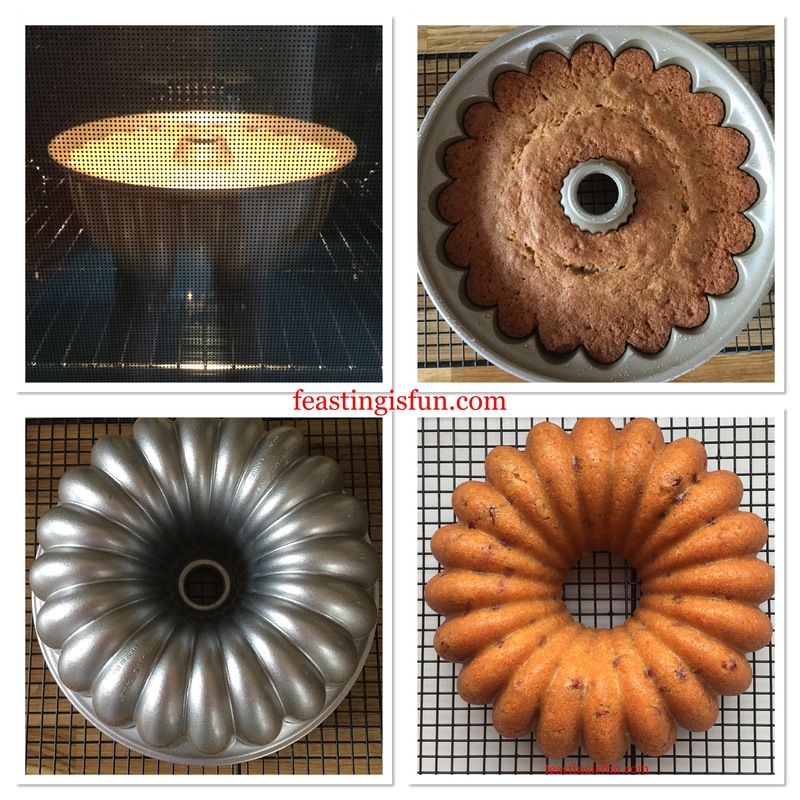 Once baked remove the cake from the oven and allow to cool in the tin for 10 minutes. After the initial cooling time has passed turn out the cake on to a cooling rack. While the cake is finishing cooling prepare the lemon drizzle. Into a bowl containing the sifted icing sugar add the juice of one lemon. Stir until thoroughly combined and free from any lumps. As soon as the cake is cool it can be decorated. Place the cake on to a plate or board. To decorate, use a teaspoon to pour approximately 1/2 a tsp of lemon drizzle on to each groove of the cake. Start at the top of the cake and work around until each groove has icing reaching the base both on the inside and outside. 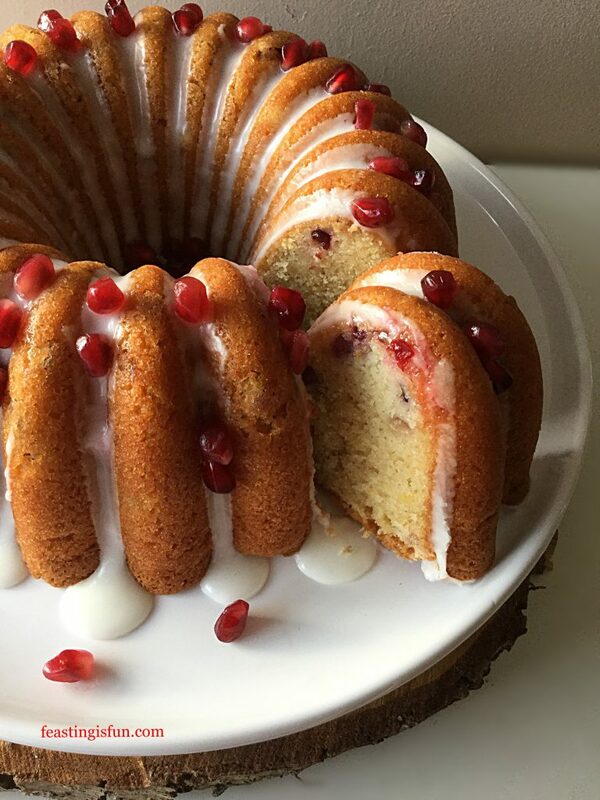 Top each indent on the cake with a pomegranate seed, adding an additional two seeds, or more, to each groove. Serve the cake sliced with a complimentary drink (lemon tea goes well) and a smile. Store the cake covered securely in cling film, or alternatively in an airtight container and eat within 5 days. During warmer weather it is advisible to refridgerate this cake. Bundt Cakes are a real favourite of mine. While the pans may be on the pricey side, look on eBay for special offers, theyproduce outstandingly beautiful cakes with very little effort required from the baker. 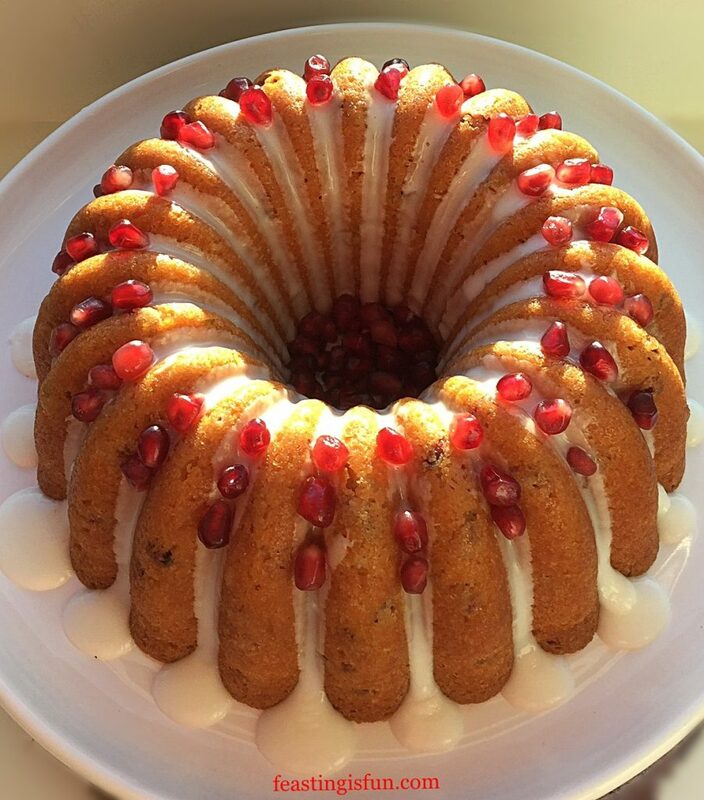 No further decoration is ever actually needed for a Bundt cake. Yet it is fun to play around with icing and additional decorations, as seen in the examples above. 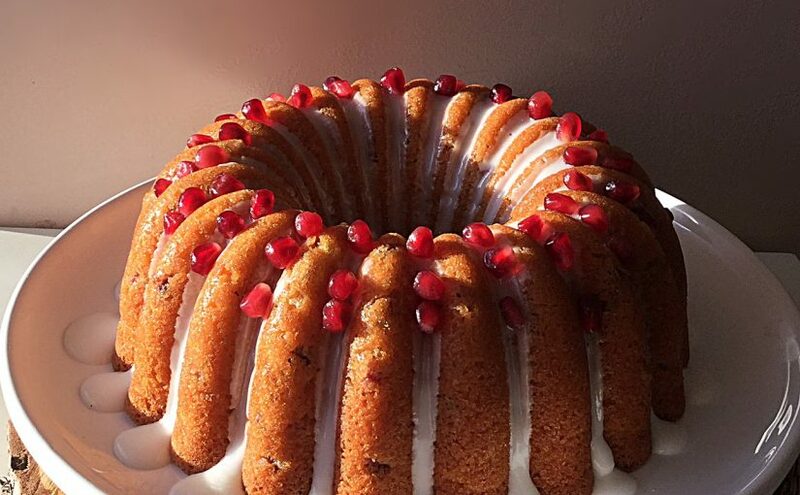 When baking a Bundt cake you can be sure to produce a show stopper every time. Whatever you are making, baking and creating in your kitchen, have fun preparing your feast. No part of this blog post may be reproduced or replicated without the written permission of the own. Please see my Disclosure Policy for full details.